On August 3, 2018, Judge John D. Bates of the U.S. District Court for the District of Columbia issued an opinion in NAACP v. Trump, ordering a complete restoration of the Deferred Action for Childhood Arrivals program (DACA). In doing so, he placed the Department of Homeland Security (DHS) in the untenable position of continuing a program that it has deemed unlawful, and unsupportable in the face of impending litigation. He also set up the possibility of even more uncertainty for a program that has been limping along in a quasi-legal status for almost a year. Judge Bates' August opinion followed his April 24, 2018, opinion in the same matter, in which he vacated a September 5, 2017, DHS memorandum to rescind DACA, but stayed that order to give DHS "an opportunity to better explain" its position that DACA itself is unlawful. In the September 5 DHS memorandum, the then-acting secretary of Homeland Security set forth her reasons for rescinding that program. Specifically, she noted that Texas "and several other states" had sent a letter to Attorney General Sessions in June 2017, in which they asserted that the original 2012 DACA memorandum was unlawful for the same reasons relied upon by the Fifth Circuit and district court opinions in Texas v. U.S., which had enjoined the implementation of Deferred Action for Parents of Americans and Lawful Permanent Residents ("DAPA"). The letter asserted that if DHS failed to rescind DACA by September 5, 2017, the states would seek to amend the DAPA lawsuit to include a challenge to DACA. The Attorney General sent a letter to the Department on September 4, 2017, articulating his legal determination that DACA "was effectuated by the previous administration through executive action, without proper statutory authority and with no established end-date, after Congress' repeated rejection of proposed legislation that would have accomplished a similar result. Such an open-ended circumvention of immigration laws was an unconstitutional exercise of authority by the Executive Branch." The letter further stated that because DACA "has the same legal and constitutional defects that the courts recognized as to DAPA, it is likely that potentially imminent litigation would yield similar results with respect to DACA." Here, the Department never stated, and the government does not now contend, that DACA's rescission reflected a change in the agency's immigration enforcement priorities. 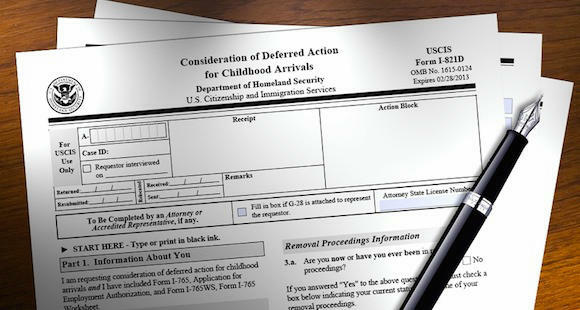 Instead, the government points to two reasons for DACA's rescission: first, the Department's legal conclusion that DACA was unconstitutional and without statutory authority; and second, its assessment of what it now calls "litigation risk" — the likelihood that DACA would have been abruptly enjoined in the Texas litigation. Judge Bates held that DHS's conclusion that DACA was unlawful was "inadequately explained". He further held that the department's "litigation risk" concern was arbitrary and capricious because "there was good reason to doubt that the second of the Fifth Circuit's holdings in Texas — that DAPA conflicted with the express provisions of the INA ... would extend to DACA," and that it was unlikely that the district court in Texas "was likely to issue an injunction bringing DACA to an abrupt halt." Judge Bates gave DHS 90 days "to better explain its view that DACA is unlawful." DHS did so in a memo from current Secretary of Homeland Security Kirstjen Nielsen. Judge Bates' August 3, 2018, decision reflected his review of that explanation. After reviewing the rationales therein, he held that DHS's decision to end DACA was arbitrary and capricious, but again stayed his vacation of the September 5, 2017, rescission memorandum for 20 days to give the government the opportunity to decide whether to seek a stay pending an appeal of that order. The Court did not hold in its prior opinion, and it does not hold today, that DHS lacks the statutory or constitutional authority to rescind the DACA program. Rather, the Court simply holds that if DHS wishes to rescind the program — or to take any other action, for that matter — it must give a rational explanation for its decision. ... A conclusory assertion that a prior policy is illegal, accompanied by a hodgepodge of illogical or post hoc policy assertions, simply will not do. "In sum, as the [U.S.] Attorney General correctly advised DHS, DACA is unlawful because it is an open-ended circumvention of immigration laws that shares the same legal defects that DAPA (and expanded DACA) did," the filing states. The DOJ asks that if Texas' request to halt the program is granted, that the court delay its ruling for two weeks to seek immediate relief from the other court rulings that have mandated the federal government keep the DACA program. That case is currently pending, and on August 8, 2018, Judge Andrew Hanen (who issued the DAPA injunction) heard oral arguments in that matter, according to CNN. In contrast to Judge Bates' decision, on March 5, 2018, Judge Roger W. Titus of the United States District Court for the District of Maryland issued an opinion denying a complaint filed by Casa de Maryland and other plaintiffs to enjoin rescission of DACA. As in NAACP, the plaintiffs in that case contended that the rescission of DACA by DHS was unlawful under the APA because it was an arbitrary and capricious decision. Although a substantial paradigm shift, the DACA Rescission Memo neither curtails DHS's discretion regarding individual immigration reviews, nor does it prevent the agency from granting Dreamers deferred action status again in the future. Hence, DACA and its rescission are more akin to non-binding policy statements, and thus not subject to notice-and-comment requirements. Judge Titus' decision is the more rational of the two. Taken to its logical conclusion, Judge Bates would have had DHS make an argument that it did not believe was valid in Texas (which, as stated above, it has not done). This is not a situation in which the government has failed to enforce a provision of law because it does not believe that its position would be legal, or the law itself is not legal, but rather one in which DHS was actually facing the prospect of litigation in Texas over the legality of DACA. In essence, the judiciary would be dictating to the executive branch an argument with which the executive branch disagrees to be made before the judicial branch, forcing the government to either defend what it believes to be indefensible, or to defer making an argument in support of a law (albeit one executed by memorandum) on the books. A ruling by Judge Hanen that DACA is not legal would set up a unique situation of the law. As Vox explains, if Judge Hanen enjoins DACA, "the Trump administration will officially be under two conflicting injunctions from the courts." If the status of DACA is complicated now for the federal government (and in particular U.S. Citizenship and Immigration Services), one can only imagine how much more complicated conflicting district court orders will make it. And Judge Hanen's order can come at any time, meaning that a Supreme Court with only eight justices may have to quickly rule on the legality of the program, as Noah Feldman explained recently in Bloomberg Opinion. When it comes to DACA, uncertainty abounds.